It’s called Clover. It’s free to download and use, and it works on every version of Windows since XP. 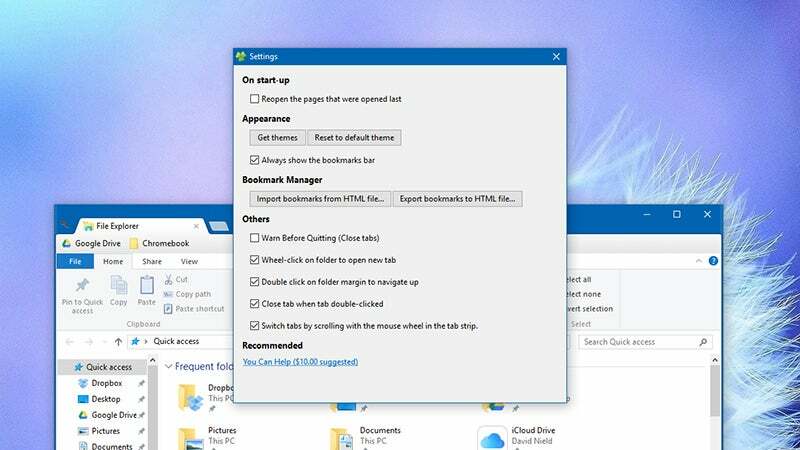 Once you’ve got it up and running — and it does take a couple of minutes to initialise — your File Explorer windows come with the tabbed headings that you’ll recognise from Chrome, Firefox, et al. The wrench icon to the left gives you access to Clover’s settings, where the program lets you turn various features on or off, including one to remember previously opened folders on startup. There is also a bookmarks bar where you can peg folders and drives you frequently need access to. To go back to the original File Explorer interface, simply uninstall Clover from your system.